Boat we purchased is a small 31 foot pocket trawler the we intend to spend most weekends, lots of weeks and upto 28 day on her at a time. We like being on the hook. She has a good size house bank, a 3.5kw gen set, and a xantrex true charger when plugged in. She does not have an inverter. We are sailors so come from the world of no genset but rather charge our batteries with the engine (our gen) and the run off of the inverter to get our 120 volts we seem to need for the small chargers, coffee maker or toaster oven. Do most boaters with a generator have an inverter for the low current items rather than firing up the gen. If so how does it hook into the system. I had a boat similar to yours, a Mainship Pilot 34 with the NextGen 3.5. I rarely used the inverter side of my Freedom 20 inverter/charger. Lets look at the case of a week long cruise with 3 anchorages, so you move every 2-3 days. I would start the genset in the morning and run it for about 30 minutes to make coffee and charge up the batteries from overnight. The batteries never got beyond about 90% full. Then I would run it for about 45 minutes to an hour at night to heat hot water for showers and power the electric stove if we were making pasta or something. Also charge up the batteries. All of my electronics items: iPads and iPhones were charged directly from cigarette lighter USB chargers so I didn't need any 120V AC for that. We would do this for two nights then move maybe 4 hours to the next anchorage. The engine alternator would come close to topping off my batteries. It would be better with an externally regulated high output alternator. That should fully charge the batteries in 3-4 hours of cruising to the next anchorage. Remember it is essential to top off any battery except Li ion batteries every 3-4 days, otherwise sulfates can slough off and fill the bottom of the battery. That drill worked fine for a week's worth of cruising. If I were going longer, the 28 days you mentioned, I would want a 200+ watt solar system to be able to fully top off my batteries on sunny days or the externally regulated alternator mentioned above. The solar panels are cheaper. I had a 220 AH pair of GC batteries for house loads. So no need for an inverter. Try it and see. we have a couple dozen batteries on-board. our house bank is 880 ah. inverters are not efficient and power hungry. we get down to 60% SoC in about three days with normal usage and only 1 of 3 fridges running. i prefer not running genset and we only use it for hot water or to charge the house bank or for hvac on very hot days. our cooking appliances are propane. i wish the inverter was 3k watt instead of 2k. we hit the max on it quite often especially when trying to use a small appliance. Can't say "most" but I think many do have an inverter for (mostly) low-draw AC loads: TV/stereo, (usually) shorter bursts of microwave/convection oven, coffee maker, charging laptops/tablets/hones, etc. Happy hour popcorn and early morning coffee without yet starting the genset, for example. To do that, I think many also add battery capacity to the extent possible. The "how" depends very much on your intended loads, your panel and wiring, etc. FWIW, ours is a combo inverter/charger, and it immediately starts charging whenever we're plugged in to shore power or the generator is on (internal transfer switch). Otherwise, it's drawing from that bank of batteries and enables the various AC loads on the specific circuits (and hence, some small appliances) that I chose. Those happen to all be via household outlets, with a couple outlets (microwave/oven, for example) being dedicated to a single appliance. Most of us don't run the generator 24/7 away from the dock. So, if you like some of life's conveniences that run on 120VAC, get an inverter. While having a nice size battery bank allows you to use the inverter at anchor, don't discount how nice it is to use underway when the power comes from the alternator instead of the battery. Use mine couple of times a week to cook with the crockpot while motoring. Our boat has two Magnum 2812 inverter/chargers and 1600ah house batteries. Most of the boat is 120v so the inverters run 24/7. When the batteries run below 60%, the generator or engines charge it back up. When on the hook, we plan to run the genset 2-3 hours a day. Every inverter needs a healthy house bank. Every healthy house bank needs a good alternator and shore charger. It's much more than just wiring in an inverter. 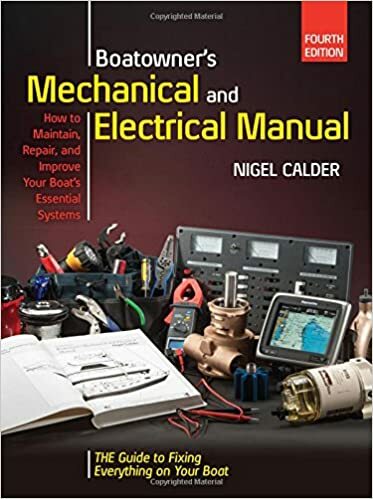 Here's a good book on all things electrical.